Remember this fabric? I made a camera strap cover out of it a few weeks ago. The fabric is Belgian Linen and I wish my whole bedding set was made of this stuff. It is soft, yet has enough body to make it just delightful. I purchased it from Love from Hollywood on ebay. She has an etsy shop with other Rachel Ashwell items but this one was from her ebay shop and I’m not finding it. You could message her through her etsy shop and ask! This dress pattern was created by a good friend of mine. We have worked together before on the art of drafting patterns. (Do you get the feeling that I think I’m an artist???!!) Anyway, my friend drafted the pattern and I was privileged to have the pattern handed to me to see what I would come up with!!! My version is a little different from hers – I have plans to make another one like she did but I didn’t have the fabric I wanted for that and I DID have this fabric. This darling little girl is my friend’s daughter. My girls are much bigger than this now. Isn’t she a cutie!? 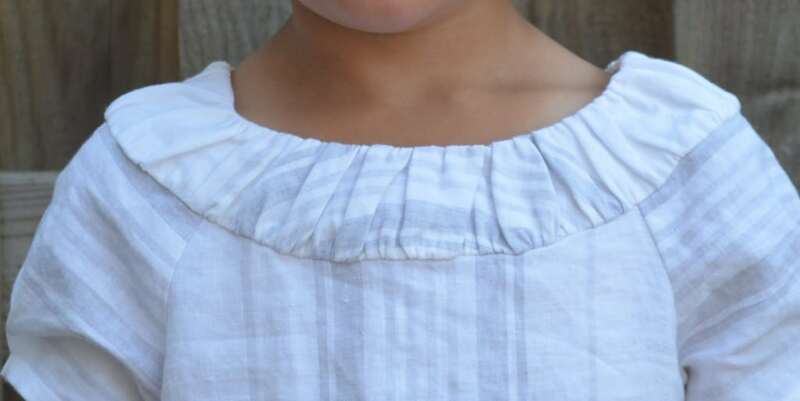 This ruffled up neckline is just so cute. And the Raglan sleeves. I love it! And the fit. Oh the fit!! I am just having fits over the fit 🙂 That is where my friend excels. Give her a design and she can make it fit like a dream. It’s a gift I tell you. When we were working together we would do the same things, use the same techniques, the same tools, and hers would fit better every time. I am so excited to be working with her again. 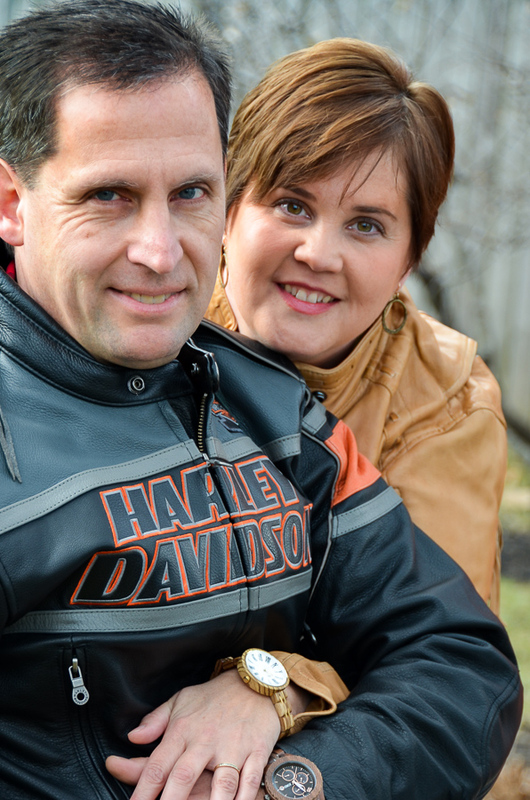 We have some ideas in the works so stay tuned! I used an invisible zipper in the back. Invisible zippers are my favorite way to allow for getting a garment on and off. So simple and such a beautiful way to finish a garment. I did a tutorial on how to put an invisible zipper in. You can find it here. Close-up of the back of dress showing the tab of the zipper. I kept the zipper down from the top because the way I constructed the dress it was easier to have a nice finish on the zipper that way. That meant there was a space of about an inch and a half above where the zipper stopped. To keep that together I used a metal hook and made a thread eye. Instead of gathering the bottom of the sleeve slightly to bring it in to the size it needed to be I made a box pleat at the front center of sleeve. I do this often with little girls dresses instead of gathers. Quick, easy, and cute! 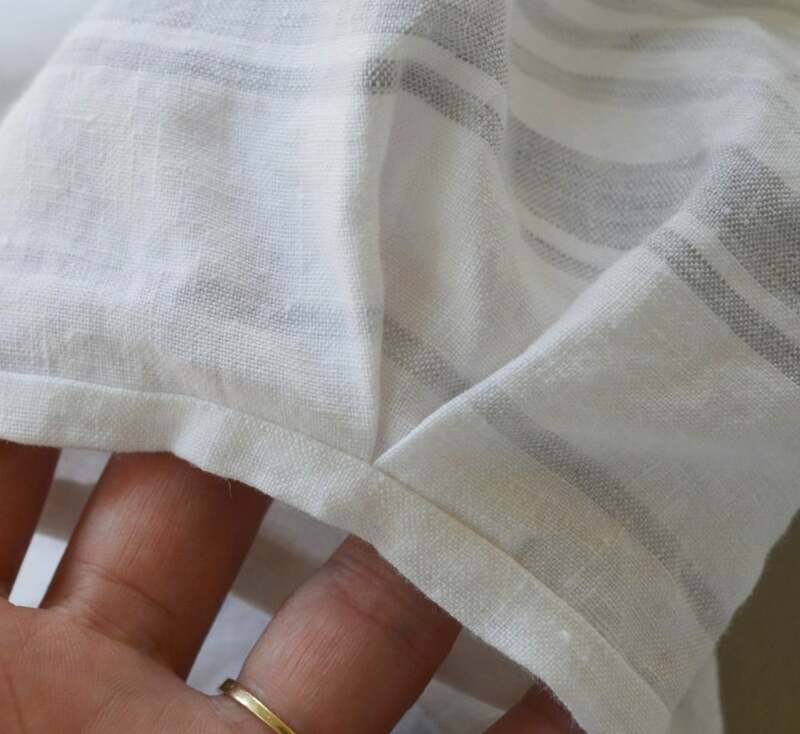 I cut a strip of linen, sewed it to the bottom of sleeve, pressed a hem in it, pressed it under and hand sewed it. Basically bias binding made from the linen fabric only I didn’t cut it on the bias. Linen is great like that – no need to use the bias. The weave is flexible enough it lays beautifully without being cut on the bias. I used the same treatment on the hem that I used on the sleeves. 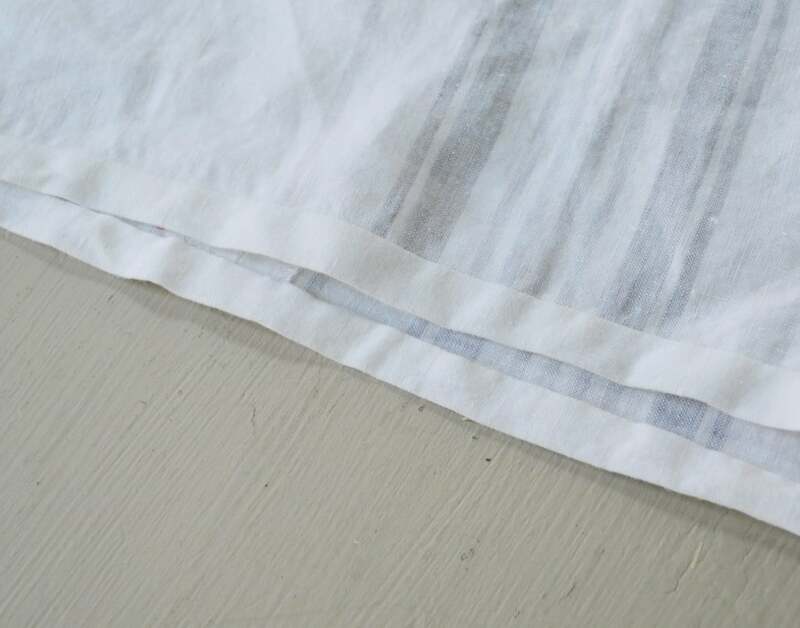 Side seams are sewn with a french seam. 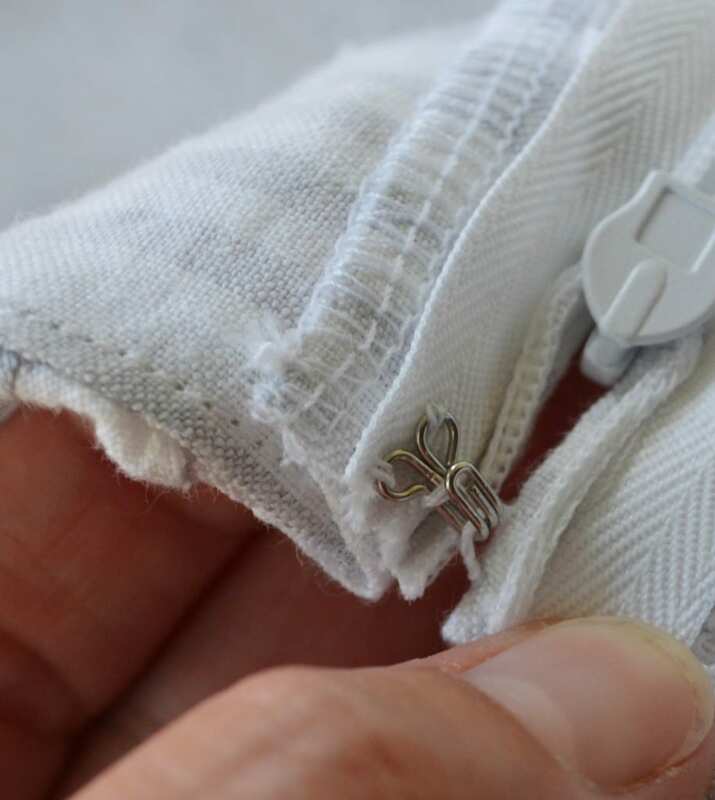 This is the easiest heirloom sewing technique. It looks difficult and it looks like it would take a lot of time. 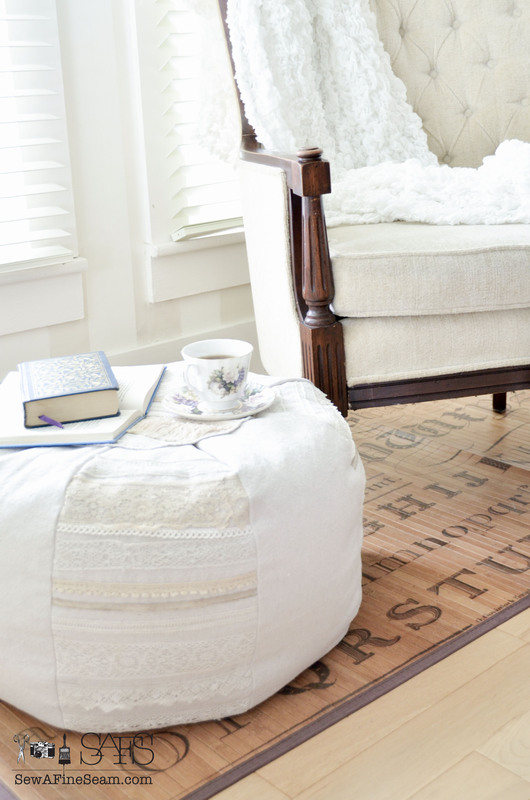 It is neither difficult or time-consuming and it adds such a special finished touch. I showed how to do this years ago and I need to do a new tutorial on it. Here is the one I did before. So what do you think? Do you like this pattern? Would you like to see some more versions and details we have in mind? Thanks to my willing little model – it is so much nicer to photograph a garment on someone than just hanging on a hanger!! Oh how adorable! It looks so pretty and cool. Sooooo cute as always! Thx for sharing! Cute, cute. I have so many projects going on right now but the idea of sewing for a little girl is never far….have to force myself to remember I have time to sew big girl dresses. The dress and your little model are both pure perfection. Truly lovely. Darling!! I love the dress. 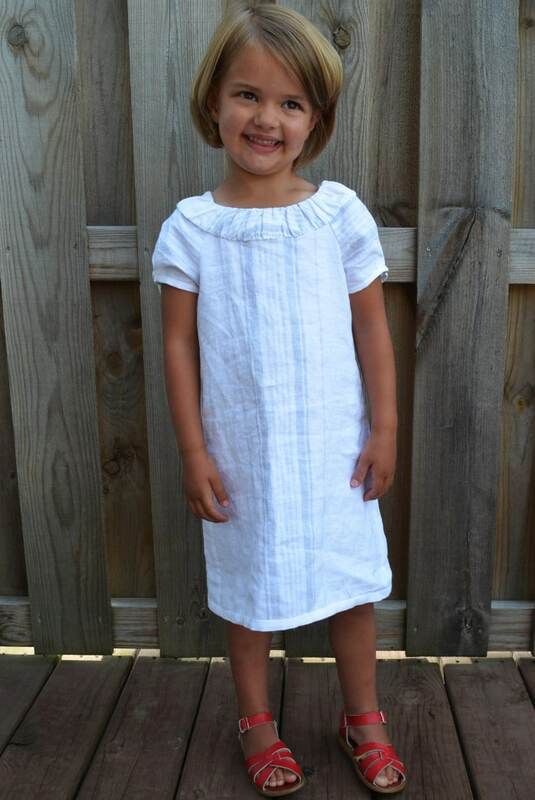 I can’t wait to start sewing for my little miss! Your friend’s daughter is GORGEOUS!!! Oh and the dress you made.. is FABULOUS! !